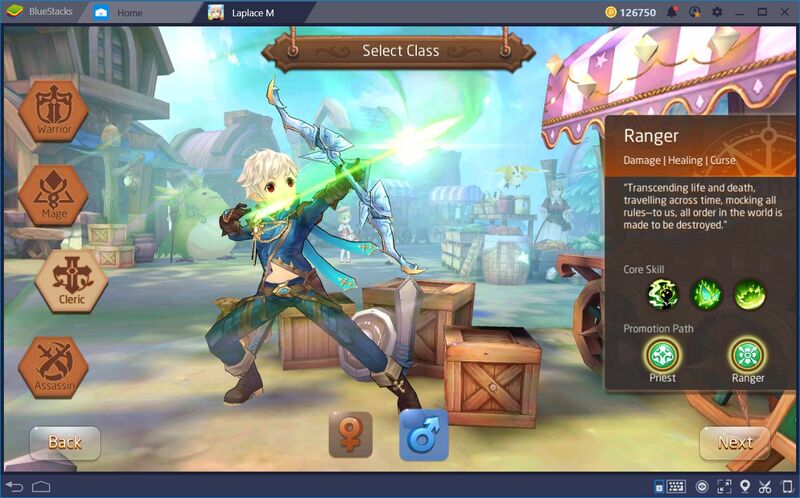 When it comes to choosing a class in RPG games like Laplace, your decision will heavily influence your success in battle. A significant part of your enjoyment in these titles revolves around you liking the playstyle of the class that you choose. 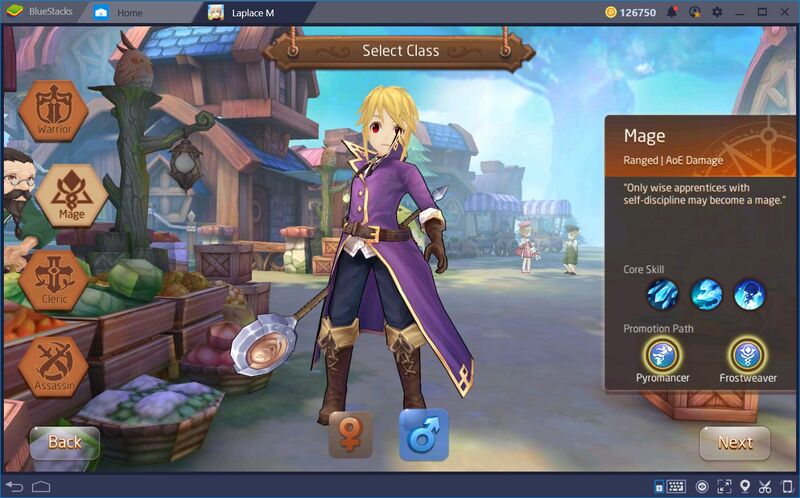 After all, if you like destroying your foes with brute strength, it wouldn’t make much sense for you to choose Mage as your starting class, right? Furthermore, in contrast with other games, the classes in Laplace distinguish themselves from the rest in more than just their looks. In this sense, every class feels—and plays—very different from the others. 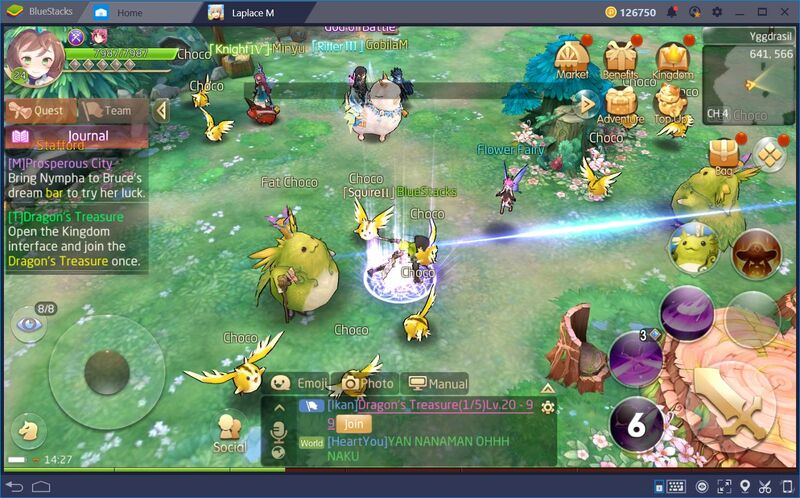 Luckily, this game has something to offer to every player: From those who employ brute force, or cunning and stealth, to those who use the elements to rain destruction on the battlefield, Laplace has lots of diversity in its play styles. 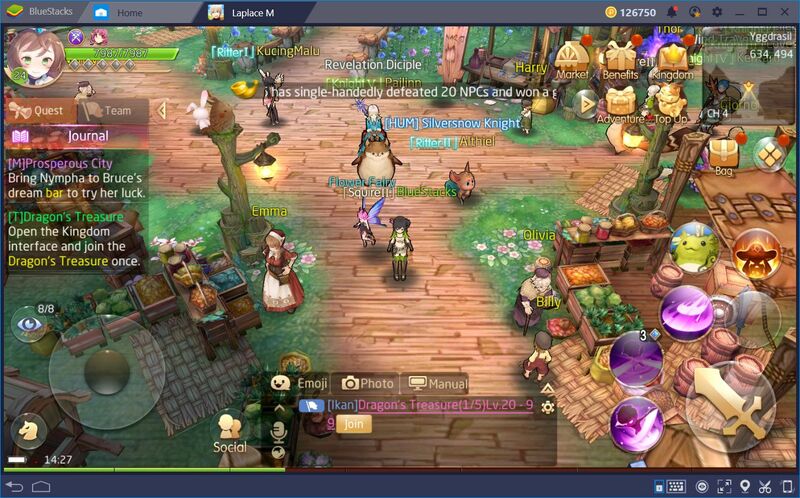 In other words, regardless of your preferred play style, you will likely find many hours of fun in this game, especially if you play it on BlueStacks. However, if you’re like us, and have no playstyle preferences, in particular, picking the right class from the start is a bit complicated. 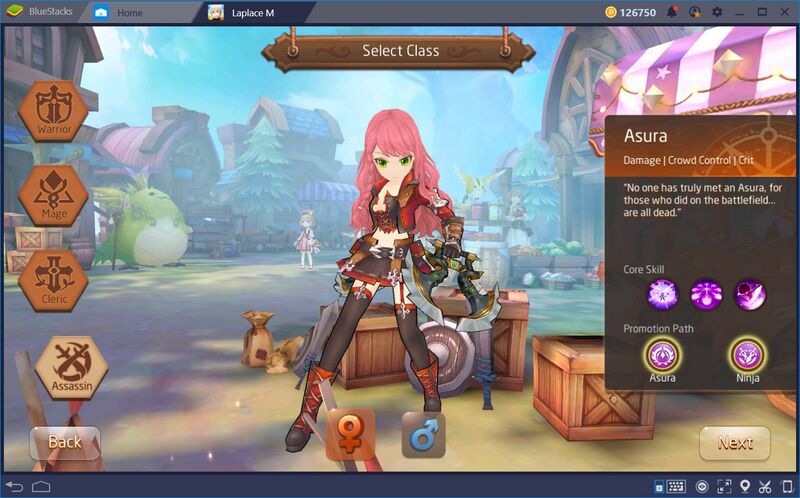 Even though there are only four classes, you will find yourself staring at the selection screen for hours, indecisive. If you can relate to this problem, then this article was written just for you. However, we recommend—if you haven’t done so already—to first take a look at our Laplace M review to learn about the game’s premise, as well as its basic gameplay. 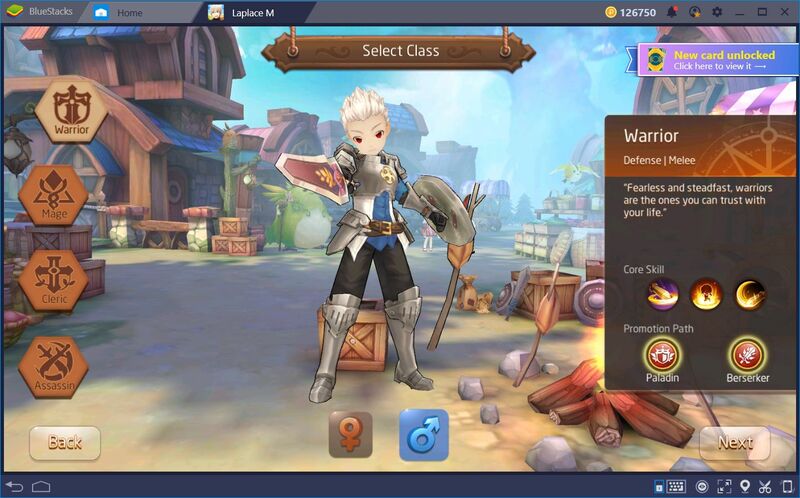 In this guide, we will talk about the four initial classes in terms of skills, strengths, weaknesses, and playstyle. Furthermore, we will briefly go over the specializations for each of these. No modern RPG is complete without the warrior, mage, and rogue trifecta, and Laplace M is no exception. Warriors in this game are the resident tanks, designed to withstand insane amounts of punishment and deal it right back to the enemy. With sword and shield in hand, this class specializes in crowd control skills along with other attacks that can damage everything standing in his way. Their main abilities consist of attacks to displace their enemies, stun them, and hurt everyone around him. In this sense, this class only feels at home when surrounded by multiple foes. Warriors are ideal for players who like to face every challenge with their swords held up high. Their amazing durability makes them awesome for beginners, as well as veterans. 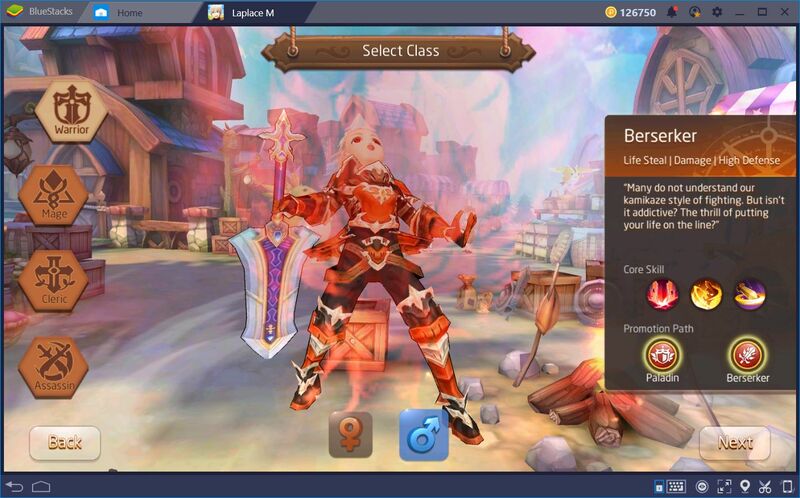 In the right hands, this class is not only the most sturdy but also very durable since they can heal themselves to an extent. The Warrior can advance to become a Berserker or a Paladin. This choice is polarizing for the class since it drastically affects its effectiveness at certain roles in combat. Paladins are purely defensive, with many options to shield and heal themselves, while Berserkers are powerhouses that can decimate their foes but are much more fragile than their counterpart. Spellcasters in this game have the potential to dish out tons of damage but have a significant learning curve compared to the rest. Their skills revolve around summoning ice to deal damage and slow or freeze their enemies. Their abilities to destroy their foes or, at the very least, keep them frozen at all times, makes them ideal for taking on challenges far above their Battle Rating. In other words, in the right hands, a Mage can perform feats that, for other classes, would be impossible. One of the most important spells for a Mage is Blink, which allows him to move forward at high speeds, leaving a trail of ice behind him and freezing everything in the way. However, the freeze effect of this spell is only the icing (no pun intended ) on the cake as its true utility comes from its movement capabilities. In this sense, even though the Mage is quite slow in his own right, his Blink ability allows him to move freely across the battlefield and to dodge all of the boss’ attacks, greatly increasing his survivability. This class is ideal for those who value strategy and cunning over brute strength. Magi have the potential to deal tons of damage in little time but have a higher skill ceiling than, say, Warriors. 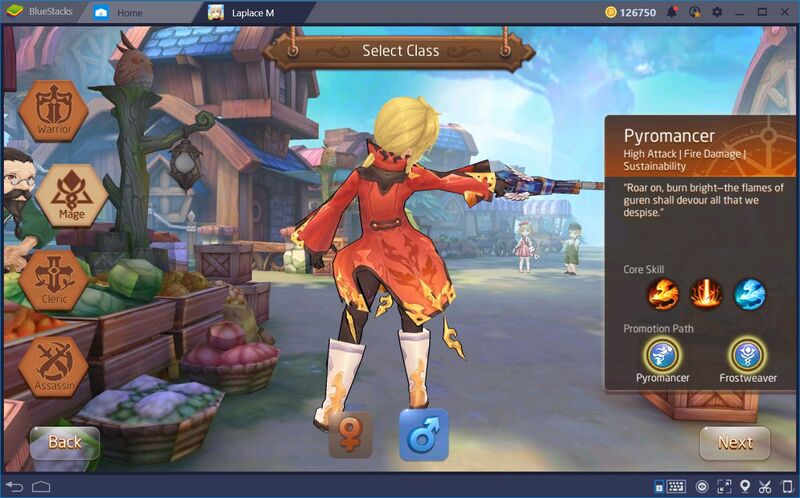 Furthermore, their specializations—Pyromancer and Frostweaver—help to either further magnify their destructive capability, or to increase their survivability with additional crowd control skills. Contrary to the concept of healers in other games, the clergy in Laplace M is very powerful—almost as powerful as offense-oriented classes like Magi. They are almost as complex to use as these spellcasters but suffer less from player mistakes since they can heal themselves whenever this happens. In the beginning, Clerics are more oriented towards healing and staying alive at all times. Since they have two separate healing skills, dying with this class is almost impossible, even against the toughest bosses. Their survivability is on par with that of a Paladin in terms of defense. However, Clerics shine truly when they are part of a group; when they can focus entirely on healing and on keeping their allies alive and in the fight. With one of these guys in your group, nothing can possibly go wrong. Nevertheless, these Clerics can change considerably after transferring class. On one hand, if they become Priests, their healing abilities increase even further, to the point where they can learn a spell to grant their allies invincibility for several seconds. On the other hand, if they choose to become a Ranger, they will learn many abilities for dealing damage, while also keeping some of their healing skills. 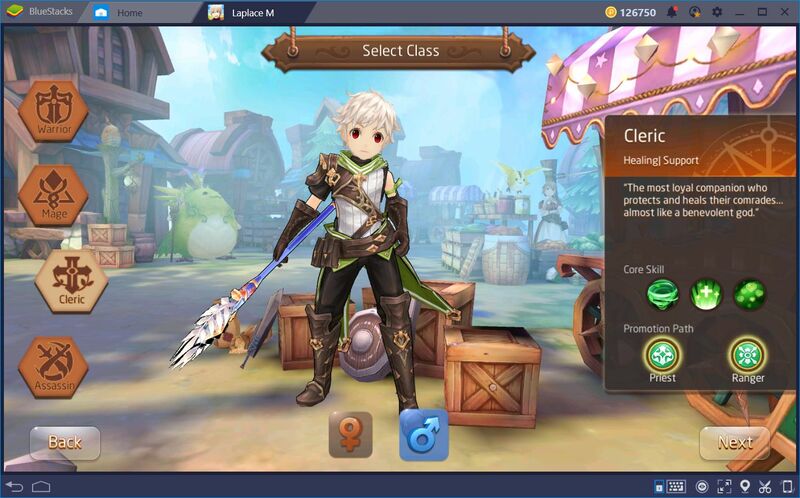 If you’re on the fence about which class to choose, we recommend going for the Cleric as they have plenty of tools for both solo and group play. In a nutshell, Assassins are units with the highest damage potential in the entire game. This class revolves around speedy attacks with a high crit rate. In other words, the majority of his damage comes from basic attacks, though they also have many abilities that can deal considerable damage, especially when landing a crit. However, they are a bit difficult to use since they combine the strength of a Warrior with the frailty of a Mage. In this sense, while it’s easy to destroy your enemies with an Assassin, you must always remain mindful of your surroundings to stay alive. This is one of the more gear-dependant classes since his power increases considerably when using the right equipment. Assassins thrive when equipped with agility-enhancing gear as this attribute increases their crit rate. Assassins are perfect for players who like to throw caution to the wind and want to focus exclusively on offense. Just like Clerics, these stealthy fighters perform best when in a group, especially when there’s a warrior that can keep the enemies distracted while the Assassin goes to town. Both their specializations are designed to further increase their offensive potential but in slightly different ways. 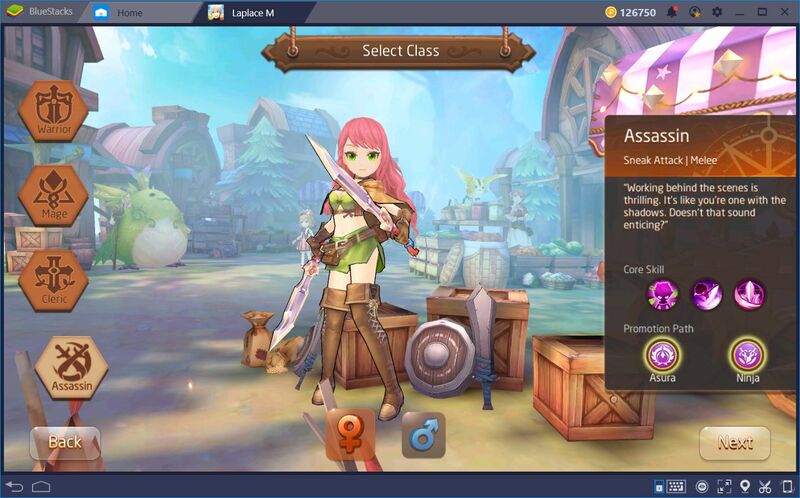 These are the four available classes in Laplace M. As you can see, each of these is radically different than the others and have specific roles to fulfill during team play. Nevertheless, with the information we’ve shared in this guide, you can make the best decision according to your playstyle.